HENLEY Dragons, consisting of paddlers aged 14 to 63 years, have just completed a successful summer season where they won the standard league. 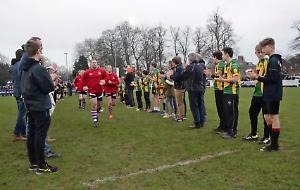 The national league season comprised eight races in venues ranging from Bristol, Worcester, Liverpool, Stockton-on-Tees, Nottingham, St Neots and London where Henley remained unbeaten in the standard league to win the title. The events consisted of 200m and 500m races. All crews contest two or three heats with their aggregate times deciding whether they compete in a major or minor cup final or plate or bowl final. At many events throughout the season Henley found themselves competing in the major cup final against rivals from the premier league and on one occasion in Crosby, Henley beat all comers to win the 450m major cup final. For Stockton-on-Tees, Henley were unable to raise a full crew so formed a composite crew with Bristol Empire Dragons and so had to share the points with Bristol. Nearest rivals St Neots earned the full 15 points for finishing second so headed the league table at this stage of the season. The final BDA event of the season was national championships where Henley Dragons were placed second after winning the junior 200m and 500m events and finishing third in the open class 500m, fifth in the 200m event and sixth in the 2,000m. The Henley Dragons also picked up the accolade for the most improved BDA team of the year. After receiving trophies for their successes at the national championships Henley were presented with the standard league champions trophy which was accepted by captain James Blake and coach Graham Bliss. Henley also impressed at the Great River Race where they finished second. Further to their successes with Henley, a number of paddlers had represented GB at the European Championships in Rome, each winning a medal or medals. Peter Boyle, Brett Saunders, Sam Chamberlain, Sam Boxley, Adi Wakelin, Ben Harvey and Ed Pearson represented the U18s/U24s, James Blake represented the Premier Dragons, Carolyn Lewisohn, Steve Hobson and Julie Rollinson the senior dragons 40+ and Tim Nunn the grand dragons 50+. Henley Dragons are now preparing to compete in the Henley winter series which will be held during the autumn. Anyone interested in joining should email henleydragons@yahoo.com for more details.